Business for Social Responsibility (BSR) and the Pacific Institute are pleased to announce their joint publication of a new trends report that focuses on corporate water strategy. 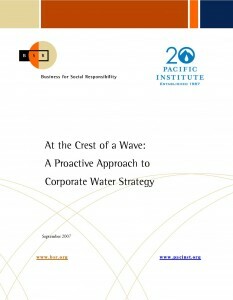 At the Crest of a Wave: A Proactive Approach to Corporate Water Strategy explains the drivers behind water trends, their implications for business and, most importantly, how to prepare for them. “It is clear that water trends pose a threat to business,” said Emma Stewart, Ph.D., BSR Director of Environmental Strategy. “In the next two to five years, companies will need to adapt to availability, quality and access concerns. Proactive corporate action that dramatically overhauls how companies use and invest in water supplies will be crucial for mitigating risks, gaining regulatory and community goodwill, and improving reputation,” she said. A global crisis in access to clean water is emerging as freshwater resources become scarcer or polluted, and businesses will increasingly find themselves grappling with water constraints in various sourcing, production and retail sites around the world. According to the United Nations, if present consumption patterns continue, two-thirds of the world’s population will live in water-stressed conditions by the year 2025. In fact, today more than 1 billion people around the world lack reliable access to clean drinking water and 2.5 billion people lack adequate sanitation. At the Crest of a Wave steers readers through developing and implementing a two-phase corporate water strategy, and includes examples from companies such as Unilever, Nestlé, Toyota, General Motors, Anheuser-Busch, GE, Proctor & Gamble and more. Download this new Trends Report at www.bsr.org/WaterTrends or contact Linda Hwang at lhwang-at-bsr.org or Jason Morrison at jmorrison-at-pacinst.org for more information. Since 1992, Business for Social Responsibility (BSR) has been providing socially responsible business solutions to many of the world’s leading corporations. Headquartered in San Francisco and with offices in Europe, China and Hong Kong, BSR is a nonprofit business association that serves its 250 member companies and other Global 1000 enterprises. Through advisory services, convenings and research, BSR works with corporations and stakeholders to create a more just and sustainable global economy. For more information, visit www.bsr.org. The Pacific Institute is dedicated to protecting our natural world, encouraging sustainable development, and improving global security. Based in Oakland, California, the Institute uses interdisciplinary analysis in order to develop real-world solutions to problems like water shortages, habitat destruction, global warming, and environmental injustice. Founded in 1982, the Institute celebrates its 20th Anniversary in 2007.